Association for Struggle Against Sexual Violence has been working on invisible, ignored forms of violence in society since its foundation. The fundamental element of our field of struggle is this invisibility regarding sexual violence, which is, in fact, restricted to private space, cannot be spoken easily and even if it is spoken, language used blames the person exposed to this violence. We see the reflections of this attitude in the streets, educational institutions, households and workplaces; in brief, in everywhere. And we encounter improper news language, mostly in the mainstream media. The language used in news banalises sexual violence, makes it invisible, marginalise the perpetrator and treat the survivors as mistaken or stigmatize them. With this project, we intend to put the transformative influence of communication and solidarity in the struggle against sexual violence by stating that sexual violence is only prevented through awareness, education and implication of protective/preventive approach. The project covers seminars discussing dating violence and introducing the concept of safer relationship, ‘rights based journalism about sexual violence’ trainings oriented to the university students studying media and communication as well as media workers and also online tools and printed materials. To raise awareness about gender based violence and sexual violence in both language used and in relationships. To transform the societal perception regarding gender based violence and sexual violence and related violent language and generalise a rights based feminist approach to practice in relationships and “private” spaces. To change the sexually violent language and create an atmosphere in the media field based on mutual respect and independent from sexual violence. To reduce and make visible the violence experienced in the workplaces by motivating media institutions to prepare a policy text on preventing sexual violence. To spread the awareness raised through the project to the general public by producing videos, informative brochures, visual materials and online tools. To organise seminars titled “From Dating Violence to Safer Relationships” both in İstanbul and across Turkey with participation of university students. To organise ‘rights based journalism about sexual violence’ trainings oriented to the university students studying media and communication as well as media workers. 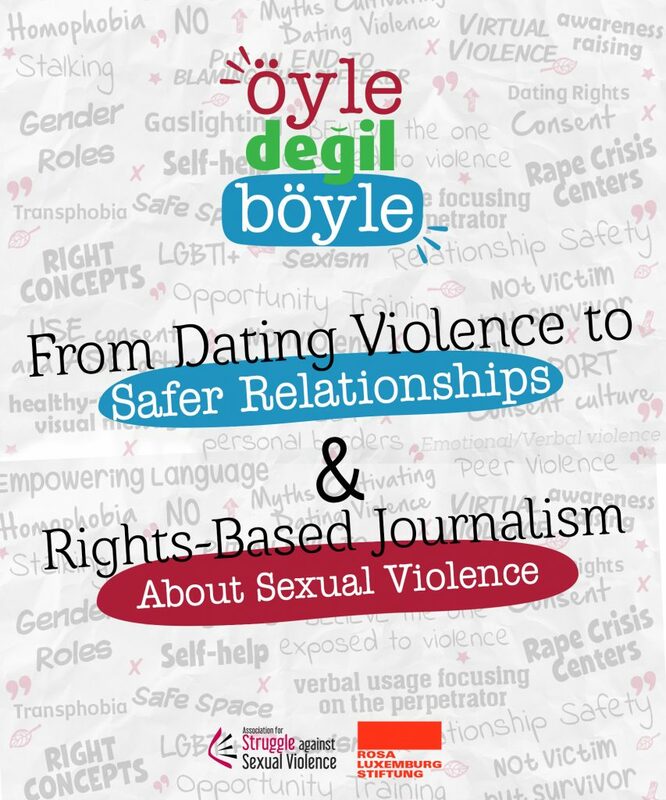 To produce a sexual violence policy text oriented to media workers and a directive for media workplaces, together with women and LGBTİ+ journalists after talking on their sexual violence experiences. Sponsored by the Rosa Luxemburg Stiftung with funds of the Federal Ministry for Economic Cooperation and Development of the Federal Republic of Germany. This publication or parts of it can be used by others for free as long as they provide a proper reference to the original publication. The content of the publication is the sole responsibility of CSMD and does not necessarily reflect a position of RLS.